Dr John Pomeroy is the Canada Research Chair in Water Resources and Climate Change (Tier 1), Professor of Geography and Director of the Centre for Hydrology at the University of Saskatchewan, an Honorary Professor of the Centre for Glaciology, Aberystwyth University, Wales, a Visiting Professor of the Chinese Academy of Sciences and an Institute Professor for the Biogeoscience Institute of the University of Calgary. 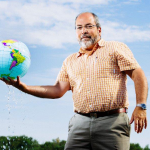 He is a Fellow of the American Geophysical Union and the Royal Geographical Society. Professor Pomeroy has authored over 250 research articles, reports and books, conducted research in western and northern Canada, the United States, Bolivia, Russia, Wales, Scotland, Nepal, China, Chile and Japan.